Unicorn cake made with a cream colour butter cream icing. 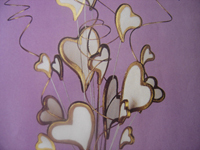 The decorations can be in colour’s of your choice. 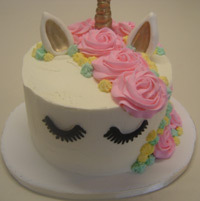 For Unicorn cake choose from Chocolate, madeira , vanilla or banana. You can have the number changed and a name added if you wish. Now slashed Down to $45.00 for the month of August. Or if you prefer the horse can be changed to an animal of your choice. This is made from fondant icing and royal icing. Deep cakes for a trendy effect. Icing flowers in colours of your choice. 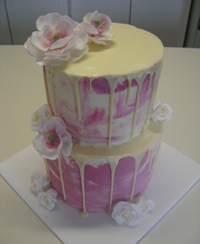 The marbled buttercream effect can be changed in colour if you don’t want a pink theme. Slashed Down to $260.00 . Icing hearts on wires to place on top of your cake. Edged in gold for a bit of bling. Made in colours of your choice. These were $25.00 Slashed down to $20.00. These prices are for orders placed in the month of August 2018. Your cake order can be created for later in the year, for when you need it. You must place the order in August 2018 to get the discount special.